These Accu-Tab chlorinators are a few of the many models designed for use in industrial applications. View all industrial options. Many industrial facilities use a local water supply to rinse, spray, coat, wash or cool during processing. End products can be affected by unwanted minerals and contaminants, and bacteria such as Legionella, which causes Legionnaires' disease, can cause illness. The Accu-Tab® tablet chlorination system treats water to the highest standards. The powerful 68% calcium hypochlorite tablets deliver consistent, controllable levels of chlorine residual to kill harmful bacteria and control algae. Chlorine is also useful in preventing biological growth in still water. 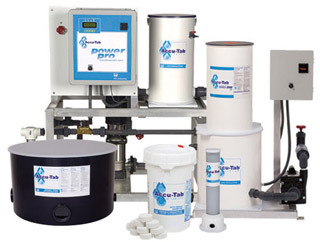 At a small capital investment, the Accu-Tab system delivers consistent chlorine delivery with no peak times or downtime. It is low maintenance requiring less manpower and no additional equipment to operate. Accu-Tab tablets maintain efficacy even in uncontrolled interior environments such as factories. Easy Installation with Options The Accu-Tab chlorinator delivery system is easily installed and integrated into existing operating systems. It is available in a variety of sizes and can be customized to meet specific application needs. The system is supported by local, trained specialists who provide installation and technical support. Contact an Accu-Tab system representative to learn how the system can solve your industrial water treatment challenges. Learn about the Accu-Tab® Chlorine Tablet System.